The past two decades have seen the dramatic rise of digital platforms as a revolutionary business model for creating value in a connected world. However, platforms have failed, as of yet, to make inroads into the education and healthcare industries. In this post I explore why. 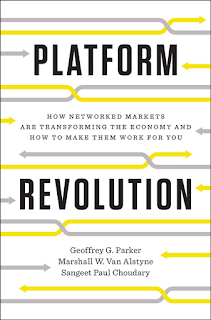 In their 2016 book “Platform Revolution,” Geoffrey Parker, Marshall Van Alstyne, and Sangeet Paul Choudary provide a detailed and accessible overview of the strategic decisions firms face when trying to enact a digital platform business model. As a primer in understanding how digitization affects business strategy, it is hard to beat. 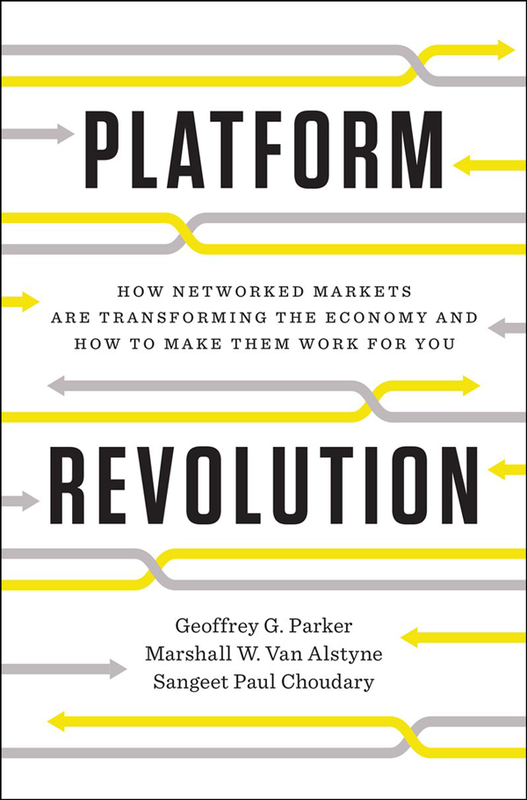 Over twelve chapters the authors step through the theory of platforms—including the importance of “network effects,” the economic term for the increasing value that platform users gain the more other users there are on the platform—and the practical challenges of building a successful platform, such as the “chicken and egg” problem of getting an initial critical mass of users on board. The book’s final chapter discusses “the future of the platform revolution.” Why have some industries adopted digital platforms faster than others? Which industries will be revolutionized next? The authors identify four factors that stimulate platform adoption in an industry: information intensity, non-scalable gatekeepers, fragmentation, and extreme information asymmetries. Three factors slowing “platformization” are strong regulatory control, high failure cost, and physical resource intensity. In light of these factors, the authors analyze education, healthcare, energy, finance, and other industries. Why isn’t there (yet) an “Uber for Doctors” with the same level of success as Uber for drivers? The authors argue that the positive drivers are very strong in education and healthcare, and that it is mainly the power of regulators and incumbent suppliers that holds back the transformation of these industries to platforms. I suggest a further reason why education and healthcare are fundamentally problematic to move onto platforms. It is grounded in a subtle but important distinction made in the economic subfield of industrial organization (IO) between different types of goods. IO economists distinguish between ‘experience goods’ and ‘credence goods.’ Both types of goods are subject to asymmetric information, in the sense that the buyer cannot observe the goods’ quality prior to buying it. The distinction is that with experience goods, the quality is revealed to the buyer after they use the goods—examples include eating at a restaurant or staying at a hotel in a new city. We are uncertain how good the service will be when we make the reservation, but after having experienced the goods we know exactly what the service was like. In contrast, with credence goods we cannot tell the quality even after we’ve experienced the goods. We can only take it on faith that the service was good or the advice was correct. This is a deep form of informational uncertainty. An example would be strategy consulting advice that McKinsey provides to a Fortune 500 CEO. The CEO might follow McKinsey’s recommendation to slim its product line; maybe sales decline slightly but costs decline a lot and profits improve. This could be interpreted as meaning the advice was good. But there are numerous other factors that affect sales and costs. It’s impossible to precisely attribute the outcome to the consultants’ advice. Platforms work well for experience goods. Very well, in fact. Nowadays I rarely reserve a restaurant or hotel without checking its aggregate reviews on a platform such as Opentable or Tripadvisor. Since other customers have experienced these goods and reported on their experiences, I have a wealth of information to help me make my choices. Importantly, because these are experience goods (and not credence goods), the information in those reports is meaningful. Ratings that platform users make about their past transaction partners are an essential input to platforms such as eBay, Uber, and Airbnb. The ratings create an intermediated system of trust. They make possible interactions with complete strangers, without any other form of accreditation—getting in their cars, staying in their homes, sending them cash—all because past transaction partners can rate past interactions, and thus weed out incompetent and ill-intentioned platform participants. Critically, platforms don’t work well for credence goods. Users cannot leave informed ratings of the service they received, because they do not know how good it was, even ex post. The trouble with healthcare and education, then, is that these are credence goods. They rely on such deep tacit knowledge and are surrounded by such uncertainty that even after interacting with healthcare professionals or teachers, we cannot say with any certainty whether they did their job correctly. Of course, we can rate how much we enjoyed the interaction. We can rate how friendly they were. But these things bare little relation to whether they cured our illness or taught us valuable knowledge. Grumpy doctors and stern teachers may nevertheless be effective! A sick person who visits a doctor and gets prescribed medicine may get better or may get worse; in either case it’s unlikely to be possible for the sick person to know whether they would have been better or worse without the medicine, or with a different medicine. A child in school has little sense at that precise moment of whether what they’re learning will be useful to them in later life. Using online platforms to collect ratings in these settings could be worse than useless2—it could lead to service providers prioritizing customers’ subjective sense of customer service over their actual well-being. This sets up a major limitation to the use of digital platforms in the contexts of education and healthcare. Where Parker, Van Alstyne and Choudary note that platforms can help industries overcome information asymmetries, this should come with a caveat that aggregated consumer ratings work well for experience goods, but not for credence goods. Platforms in healthcare and education may yet be able to overcome information asymmetries in other ways, such as building on existing systems of certification and legitimacy that these industries are built on. In the mean time we should be wary of prescribing the platform pill in cases where it might have harmful side-effects. Further reading: I have previously written some reflections on platforms, from a technological angle, which can be found here. The definition of platform used in that essay was different, but the concepts of a technological platform and an economic platform are highly related (e.g. see here for a review). 1 This assertion is based on the following market caps as of 11th November 2017: Apple 897b, Alphabet 720b, Microsoft 647b, Amazon 542b, Facebook 520b. I haven’t exhaustively checked all firms, and note that Alibaba and Tencent could be alternate members of the top 5 (and probably feature in the top seven). 2 Further to the deep uncertainty around quality, there is also a potential selection bias in what ratings are observable. Dead patients don’t leave negative reviews.